There were a bevy of 89’ers at Naree Wongse-Sanit’s recent wedding. Over the next few days, I hope to post some more material. All of this can be seen as a prelude to the blogging activities for the 15th year reunion for the class of 1989. ClearCreek Partners is a consulting firm that works with privately-held companies preparing to raise $5 – $50 million in capital or engage in M&A transactions. ClearCreek sources its clients through a referral-only network and puts all companies through a rigorous screening process prior to engagement. ClearCreek provides financial advisory services, business plan refinement, presentation coaching, and institutional investor introductions. Tim is married to a business school classmate and has two young children. Surfing around the Williams web — perhaps I need a new hobby — I am consistently underwhelmed with the news and publication section for alumni. Not only is the most recent Alumni Review not posted but the section on Spectrum (a “monthly Newsletter highlighting activities of the Multicultutural Center and Alumni Networks”) is pathetic. I can understand why something like Spectrum might no longer be publishing (and why it was never really “monthly”) but I don’t see the point in keeping up issues that end in December 2002. Perhaps the best guess is that there was a May 2003 issue, but that that was never posted. Strangely enough, although our household includes an alumna of color (would that be the appropriate PC phraseology?) we don’t receive it. Because of my background, I guess forget that through being white and living in the United States, I am the benefactor of a history and a country whose very foundations are based on the concept of entitlement and the idea that as a nation, we are not responsible for our actions. The very concept of capitalism on which the United States economy is based, quite proudly it seems, is rooted in that oppression: slavery. We fought and won a Cold War based on the idea that capitalism is better than the oppressiveness of communism. It is hard to know where to begin with sentiments like this. Here I always thought that the Cold War had something to do with freedom. Would Collingsworth really rather live in, say, North Korea or Cuba? In any event, I don’t want to get too political (read: boring) here, but whenever confronted with these sorts of ramblings from outfits like the MCC, I always go back to a simple question: In what nation on Earth are my daughters — of proudly mixed-race parentage — least likely to be treated different from other little girls because of the color of their skin? France? Germany? China? Japan? Although one could, perhaps, make a case from a place like Brazil, it seems that the obvious answer is the United States. For all its many faults, there is no country in which my daughters heritage will cause them so little (and none so far) heartache. I would feel better about Williams and the MCC if this point, if not embraced, were at least acknowledged as plausible. But that would require a diversity of political viewpoint that Williams does not seem to have enough of. 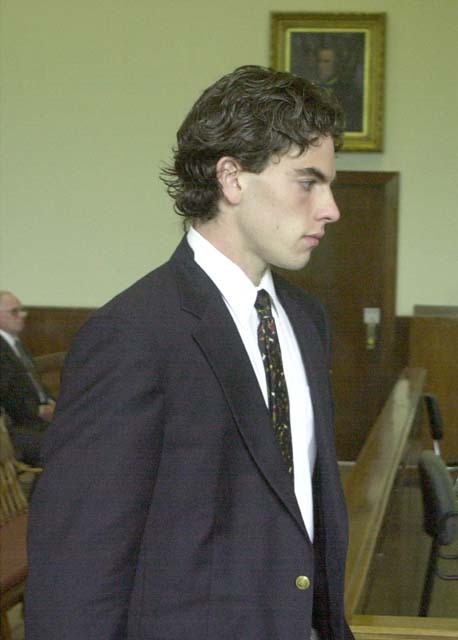 Sad to see that Scott Farley ’03 was released by the Patriots today. Of course, it is nice to see that Farley had the chance to compete at the highest level. Perhaps he felt as I did when trying out for Williams soccer — “Oh my God! How did everyone here learn to run so fast?” With any luck, young Farley will be able to combine his love of football and Williams education in some other endeavor. Just back from the wedding of Naree Wongse-Sanit ’89 and Mike Viner. Now doubt the Williams wedding photo of the event will appear in 8-10 months, if we are lucky. Naree probably knew more people at Williams during her time there than any other undergraduate. It was nice to see that she had found such a deserving husband. Above is the first page in the program of the event. If there were any demand at all, I would be happy to blog more. The 15th year reunion for the class of 1989 is now only 10.5 months away, so it is not too early to start drumming up interest. Those wanting more details can always check out the official wedding site. Note the similar color scheme! Is is helpful to have a bridesmaid who is also an ace web developer . . . The Patriots will also be trying out two other safeties, both undrafted rookie free agents. Scott Farley (#43) comes from Williams College where he was a team co-captain and three-way player, logging time on offense (receiver), defense (safety) and special teams (coverage and punt returner). He led his team as a senior with four interceptions and 35 tackles from the safety position. Prediction: Last year, the Patriots kept five safeties. This year’s quintet will be Milloy and Harrison at the top of the depth chart followed by the versatile Harris and newcomers Akins and Morris. Morris has logged time with a regular defense that Cherry has simply not been able to achieve during his time in New England making him in particular more valuable as a true backup in addition to his special teams prowess. Cherry also just turned 30 while Akins is 26 and Morris 25. The versatile Farley has a good chance at a practice squad position, where he can gain some experience to make up for a lack of “big time” competition at Williams. It’s a demanding job, one that takes a politician’s social skills, a bookkeeper’s attention to detail and an insomniac’s ability to stay awake while exhausted. In tournament terms, Jeffrey was a ” swamper,” someone who did just about everything from putting up bleachers to ridding the course of rattlesnakes. The rattlesnakes did not discourage Jeffrey from golf, and he has been behind the scenes with the sport ever since. Alas, there are no details about what at Williams prepared Jeffrey for this role, but organizing Mission House rec-room parties comes immediately to mind . . .
No one raises concerns that preference in admissions given to athletes, cheerleaders and children of wealthy alumni causes self-doubt or stigma. The fact that this concern only rises to prominence when it comes to considering race as one of many factors in admissions illustrates how difficult it will be to overcome the lingering discrimination in American society. 1) The first sentence is simply not true. Plenty of people (or is it just me?) have concerns about the preferences given to atheletes at elite colleges, both for what it does to the college and for what it does to the athletes. I would argue that the average athlete with academic credentials that at the bottom 5% of the Williams distribution would be better off at a (still excellent!) school like Bates or Denison than at Williams. I think that the same applies with regard to a Harvard versus Williams comparison. The football players who go to Harvard but who, academically, belong at Williams have made the wrong decision. 2) Note the subtle smear in the second sentence. If you disagree with Krueger by arguing that preferential admissions harms, on average, its intended beneficiaries (and if you worry about this the larger the preference given) than this fact alone is enough to demonstrate that you are a racist. The average SAT score of a legacy student at Williams may be 40 points lower than her peers (actually, I am not even sure that it is lower since high SAT students are often drawn to Williams over other options because of the alumni connection) but, to my mind, this is much less of a concern than the much larger shortfall in SAT scores for impact athletes (“tips”) in important sports. Worrying more about the latter than the former does not make me anti-athlete. Williams set a Division III record en route to capturing its seventh NACDA Directors’ Cup for overall athletic performance in NCAA championship events. With 1,158.25 points, the Ephs blew away the competition, netting 379.5 points more than runner-up Emory. Leading the charge were national championships in women’s cross country and men’s basketball; runner-up finishes in men’s tennis and women’s swimming and diving; and third-place performances by women’s tennis and women’s indoor track and field. All told, Williams placed 20 of its 31 varsity teams in the national Top 20. We Eph bloggers are as rah-rah Williams athletics as anyone, so congratulations all around. It is also gratifying to see a truly nice guy like Dave Paulsen ’87 be so successful as coach of the mens basketball team (NCAA Division III champions). However, it is unclear why Williams still needs to have so many admission “tips” — applicants who would not have been admitted were it not for their athletic prowess. Even in a world with no tips, Williams would still be at the top of the Sears Cup rankings. Class of ’89ers Fountains of Wayne’s Adam Schlesinger and Chris Collingwood were in Chicago recently, and I happened to catch this review of them in the Chicago Tribune over the weekend (you may need to register (free) to read the article – if so, my apologies!). It’s a generally favorable review and nice to see they are still going strong…just wish I had been tracking the local music scene a little more proactively so I could have been in attendance at their concert at the Metro. Apologies for the dearth of recent postings. Robert C.L. Scott, the J. Leland Miller Professor of History, Literature, and Eloquence, emeritus, passed away on June 21 in Lenox, Mass. He was 90. A Williams professor from 1946 to 1978, Scott inspired countless students and faculty members as long-time chair of the department, dean of first-year students, and Dean of the College. Scott was an early advocate of abolishing fraternities and admitting female students to Williams. I can’t find the Times article on-line. It seems a shame that Scott was not in better contact with Williams students during the last decades of his life. I am sure that they and he would have benefited from the interaction. I have a vague idea that the blog could be filled with items like this. Surely, there are a lot of Williams people that Stephan Kargere ’88 and Karen (Costenbader) Kargere ’89 would have liked to send this announcement to but whose address they did not know. So the blog takes care of the distribution for them. Of course, this theory assumes that those same people also read the blog . . . 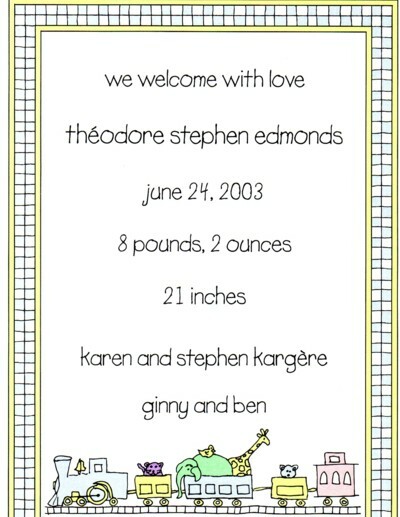 In any event, congratulations to Stephan and Karen. Other than Jim Duquette, Stephan was the only person that I know with a decent excuse for missing reunion. With luck, he, Karen and the kinds will be in Williamstown next June. In fact, this announcement might serve as a good start for the class of 1989 Reunion Blog . . .
is essentially timeless. The one that I am trying to figure out, however, is the graduation picture. I had assumed that this was from a recent graduation (why scan in old photos), but, looking closely, I (think I) recognize the faces. Am I crazy or is this a photo from 1989 or thereabouts? Lots of pictures of reunion available here — good blog fodder, if you’re still looking for that. Thumbing through the thumbnails, I found only a paltry few pix that I could identify as being of members of our class. There were more pictures of some guy in a purple cow suit than of our class. Nevertheless, there are a few, mostly identifiable without serious eye strain by our telltale purple fleece vests. Of the ones I could identify, there was one of Kerri Kazak and her husband wheeling their two children down Spring St. (no. 123), and at least two pix of Joyce Noonan Anderson and her brood (nos. 78 and 131). Also no. 125, but for the life of me I can’t tell who that is. There may be others — kids and such unidentifiable as belonging to our class due to the absence of any buttons, fleece vests, captions or other identifying information. 1) I am always looking for fodder, blog-related and otherwise. 2) The proud papa of twin girls is our own favorite Williams chemistry professor, Tom Smith, who had all sorts of interesting stories to tell at out table at the Gala Dinner on Saturday at Reunion. 3) I would also be remiss (and a bad father) if I failed to note these two cuties, hard at work in arts and craft. George has assured me that the admissions office will look kindly on both their race and their artistic talents a decade from now. I updated my post below on Williams C, 15 years later. Other entry historians are welcome to submit their own summaries. I’m putting together my final…sniff…class notes for the Alumni Review and it includes (obviously) thoughts about Reunion. Given the large number of people who made it to the Purple Valley a few weeks ago, I wasn’t able to talk to everyone and I want to make sure I encompass stories about people I might not have had a chance to catch up with. So…I’m sending out this e-mail to see if you have anything you’d like included in the column. I’d appreciate any thoughts, stories, reminisces, etc. (gossip?!) you have (and it doesn’t even have to be about the reunion). Thanks and have a great Fourth of July! P.S. I’m working off the registration list for the reunion (which may not have been complete up to date), so there’s a chance you were included in this list even if you didn’t attend. Feel free to send any other news you’d like to see in the Review. P.P.S. My deadline is creeping up so if you could get me something in the next day or two, I’d appreciate it! Outgoing class secretary Mike Harrington is looking for reunion tidbits for his last column. You should all e-mail him something. But, for immediacy (and arbitrary length) of publishing, nothing beats the blog. Here are my thoughts on Williams C, 15 years later (apologies for any mistakes, spelling and otherwise). There were 24 freshmen (as we were called then) in Williams C in the fall of 1984. Here is an update, floor by floor, as best I know. Starting from the top, we have Chris Jones, Kurt Oeler, Charlie Kaplan and Blake Robison. Only Chris made it to the reunion. He is married to classmate Cecilia Malm (also at reunion) and they have a lovely daughter named Emma. Chris continues to teach math at Horace Mann High School in NYC. We threw around the frisbee a bit although, just as it was 15 years ago, he throws much better than I. I did not see Kurt or Charlie or Blake at the reunion. Kurt (at CNET) and Blake (teaching theatre at the University of Tennessee) have made appearences in the blog before. According to Chris, Charlie is working as an architect in New York City. On the third floor were, in one suite, Ken Marcus, Dan Pyror, Stan Macel and David (DJ) Johnson. I only saw Ken at the reunion, with new fiancee/wife (not sure which) whom I was happy to regale with tales of Ken’s somewhat unusual philosophical past. She claimed to be fuly informed on the issue. Ken is the Deputy Assistant Secretary at HUD and still manages to get mentioned in places like National Review. Dan graduated ’89, I think. DJ went on to medical school and is now a high speed surgeon somewhere, but my information is spotty on this. In the other suite were me, Ed Leung, Cary May (let him rest in peace) and Josh Mellon. Unfortunately, I did not see Ed or Josh at reunion. Ed also ended up graduating with the class of 1989. When last we exchanged Christmas cards, he was married, living outside Boston and the proud father of 3 boys. Josh is married with a young son and living in Tennessee. On the second floor were our JA’s Sarah Suchman and Annie MacDonald along with Jean Janson, Sonja Lengnick, Janet Mansfield and Ellen Lee. I didn’t see any of these folks at the reunion. I occasionally run into Jean in the Boston suburbs. She is married to a class of ’87 alum (Davis somebody or other). Sonja made an appearence in the blog (lawyer in Seattle) and, according to her e-mail, is on maternity leave. On the first floor were KK Roeder, Lisa Klem, Julie McGuire, Willa Morris, Julie Cranston, Sara Hansen, Virginia Demaree and Anne Carson (who ended up graduating with ’89). I caught up with Lisa, Julie McGuire and Willa at reunion. Julie Cranston lives in the Boston suburbs (see here Eph Blog for more details). Sara Hansen (now Wilson) is a lawyer in San Francisco. Lisa told fascinating stories about working as a federal prosecutor in NYC, specializing in organized crime cases. She flew off to stange cities to meet ne’re-do-wells in the witness protection program. Julie McQuire is still running her coffee house (Zanzibars) in Des Moines, Iowa. It is always great fun for me to talk with Julie about the nuts and bolts of running a small business. Certainly the award for most read-about (in some sense) member of Williams C must go to Willa Morris. Fans of John Grisham will have noted that Willa was thanked in the acknowledgements for A Street Lawyer, a recent Grisham bestseller. She has been active n social work in Washington DC for many years. She provided Grisham with much of the background material for how DC operates. Attentive readers of the book will have noted that the love-interest for the hero is clearly modeled on Willa, both in terms of job description (running a women’s shelter) and even physical appearence. Now, if at least one member of each entry could provide a similar update. Mike and Russ would have things to write about for a long time to come . . . I have updated the title and desciption of the blog. Kim, Tracy and I have decided to keep the blog going, at least for now. Our plan is to transform it from something that focussed just on class of 1988 reunion activities into a cite of general interest to all those with an affinity for Williams. Of course, like everything with the blog, this is an experiment. We have a few ideas (and we welcome more) for what people would find interesting and useful. We are also in the process of reaching out to current faculty and students to try and broaden the perspective of the blog. In any event, it is unlikely that the blog will be as active during July and August as it was during April and May, but we will see how things develop. EphBlog is powered by WordPress and delivered to you in 1.949 seconds using 28 queries..